Remember those multi-colored chicks being peddled in Manila streets? A photographer has captured how they color the tiny animals. In the Philippines, chicks in different colors are peddled in the streets as some sort of pet. To a kid, they're definitely eye-catching. To anyone educated enough, buying one feels like setting yourself up for the wrath of PETA. But let's set aside moral issues right now. We've always been curious: How do they "breed" those rainbow birds? Jes Aznar, a photographer, posted a video on Instagram that answers the question. 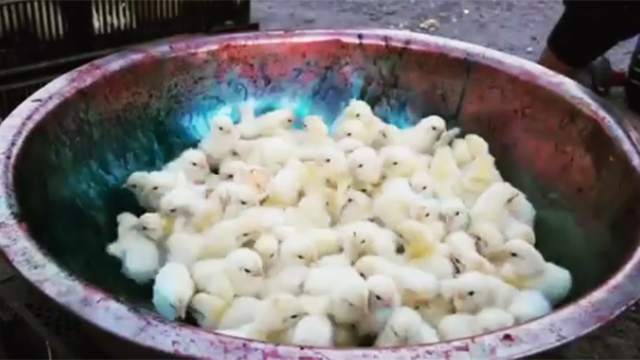 The chicks are put in a giant pan, and are sprinkled with powdered dye, and are tossed around as if you were cooking scrambled eggs.